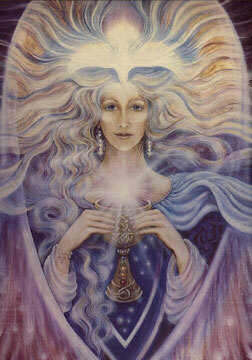 Wisdom is a woman, a crone, a goddess, and a feminine archetype. In Greek mythology, she is a barely personified Metis, swallowed by Zeus. In the Bible, she is a hidden Sophia, the goddess who became an abstract and ungendered concept. Wisdom may be found at twilight where the three roads meet as Hecate, or in the hearth fire as Hestia. She may be the invisible Shekinah who enters the Jewish home for the meal that begins the Sabbath. She was once the Celtic goddess Cerridwen. She is Saraswati, the Hindu goddess of wisdom, and Erda in Richard Wagner’s Ring of the Nibelung. In the world’s mythologies and in the collective unconscious, which are mirrors of each other, wisdom is feminine. Wisdom is usually an attribute of a goddess who is often not seen or personified, and an attribute of a woman in whom wisdom has become a conscious part of her psyche. Women gathered again this morning, wisewomen and goddesses, women who desire to grow, to explore this inner soul qualities as women, to engage in fascinating dialogs…wherever they take them. One can still be part of this summer’s beach group–Monday mornings here, and Thursday evenings. This is rich material for women of depth. Welcome.